Join us on a truly wonderful journey through the rugged volcanic hillsides of Eastern Sicily. Experience historic cities, stunning views across the Mediterranean and of course breath taking sights of Mount Etna - get ready for an awesome adventure! Oh and of course - don't forget the wonderful Sicilian food, wine and hospitality! Our ride will begin from the Historical town of Catania, here we shall spend our first night making preparations for the journey ahead with the evening available to experience the stunning Piazza del Duomo and Catania cathedral. We shall then depart northbound skirting the eastern foothills of Mount Etna; make sure you have a good breakfast as its steady climbing all morning! After a well deserved coffee in Massa Annunziata well maintain elevation before lunch in Fornazzo before weaving our way down toward the coast. Taormina marks the final stop with a tricky 1km into the cliffside town for dip in the sea and dinner. If you've still not had your fill there is the optional excursion back up towards Monguiffi, expect plenty of tight twists and turns for a whopping 30km extra! We'll then head back inland towards Linguaglossa for a coffee stop and to enjoy the scenery. We'll then head up the valley for steady loop onto the volcanoes north face with the final 10kms decending into Randazzo. Once in Randazzo you get the option to go for another 30km loop into the surrounding hills or relax before the final day! Our final day's ride will return us via Bronte and Adrano back to Catania, starting in the hills means a day of decending back to sea level and plenty of time to enjoy to scenery along the way; we do have the option to tackle one last hill up the southern face of Mt Etna before heading back to the sea at Catania. Day 1 - Travel from UK - meet early evening in Catania - you will be collected from the airport, and transferred to your hotel. Assemble / collect bikes, and attend challenge event briefing. Evening dinner + early night! Day 2 - Catania > Taormina(70km) with 50km excursion available. - Breakfast 07:15 - depart by 09:00 - expected lunch at Fornazzo- and ride to Taormina arriving mid to late afternoon - total distance - approx 70km (around 5 hours). Day 3 - Taormina> Randazzo (75km) with 35km excursion available. 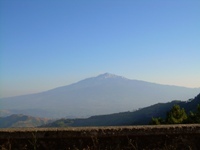 - Breakfast 07:30 - depart by 09:00 - We'll head inland towards Gaggi for some sensational views in the valleys North of Etna before stopping in Linguaglossa for lunch. The afternoon sees us tackle some brilliant rolling roads at the base of Etna before finishing in Randazzo. Day 4 - Randazzo> Catania (80km) - Breakfast 07:30 - depart by 09:00 - Almost an entire day of decending having started in the hills heading south for the coast at Catania. An easyish day awaits as we skirt close to the volcano all the way back to Catania. Day 5 - Easy breakfast. Short transfer to Catania Airport for return to UK. This itinerary is normally run in either late spring or early summer, or late summer early autumn. At these times the temperatures will be warm without being too swealtering! But, as ever, we should be prepared for the full range of weathers - both hot and sunny and (less likely) cool and showery - be prepared!